This client script simply makes AES encrypted packets for a given host and port (the arguments), with the class EncryptedStream. It then sends the packets and prints out any received stream. The snippet also shows an example of a client packet, with some request options (which we will see the response later in the network dump). The second file was the server.py script, which is basically a Redis like database (hence, the nosql title). Unlike SQL databases, Redis maps keys to types of values. In this challenge, the idea was to recover an entry that had the key flag returning the value of the flag. # This is totally encrypted, right? This script pretty much gives away all the requests that you can issue to inspect the database. In addition, a crucial detail is to understand how the client encrypts the commands using the electronic codebook (ECB) block cipher type. In this type of operation the message is divided into blocks that are encrypted separately (PyCryptos's AES.MODE_ECB). The response 4f4b is OK in ASCII, meaning that the switch ENCRYPTION HEX was on (it's good to keep in mind that the "encryption" is actually just an encoding in hex, i.e, completely reversible). Finally, our MD5 for the flag was printed as b7133e9fe8b1abb64b72805d2d97495f. As it was expected, searching for this hash in the usual channels (for example here, here, or here) was not successful: brute force it is not the way to go. 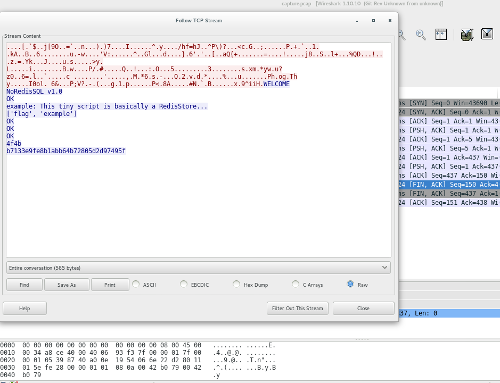 However, we do not have the AES key used by the server, only an example of communication given by the PCAP file. How do we get to send a GET flag message? We are able to learn that if we send a command without arguments or an invalid command, the argument variables (args) is not overwritten: it gets the same args value from the previous valid request! That's wonderful! We send the invalid command and a valid command with the argument that we will keep: ION HEX\nMD5 flag. We send the invalid command and a command without an argument: edisStore...\nGET (this will get the last valid argument (flag), returning us the flag! ).